I went the other night to hear Martin Biddle’s talk to LAMAS about how he came to the idea that the Saxon settlement in London might have been along the Strand and not inside the Roman walled city. It was very interesting to know how he made the connections, and that another archaeologist (the late Alan Vince) came up with the same idea at the same time. Near the end of his talk, MB began to talk about the Saxon harbour area, and to speculate on what it might have been like – a topic of great interest to FROGs. 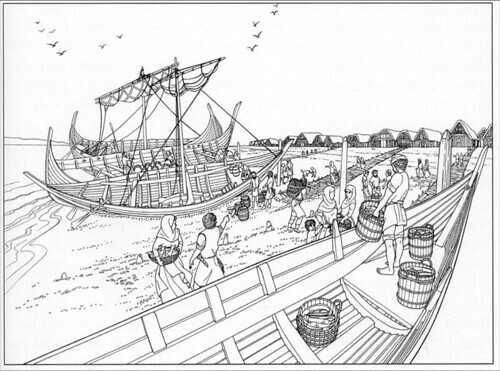 He suggested that a possible comparison might be the port of Dorestad in the Netherlands, where structures that might be called quays or jetties were built out into the river Rhine as it changed its channel over time. Could London’s Saxon harbour have been like that? As he pointed out, the evidence is probably buried under the Victorian Embankment, but he thought excavating in the grounds of the Middle Temple might be interesting! Talking to other FROGs afterwards, we agreed that we had always thought that the Saxons pulled their ships up on a beach – the Strand – but we had no idea whether these ships were flat-bottomed enough to make this practical. Maybe they would have wanted a jetty or quayside? I think it’s over to Gus and Eliott to tell us a bit more!